Did you see this blog post by Seth Godin? He provokes us to reflect ! 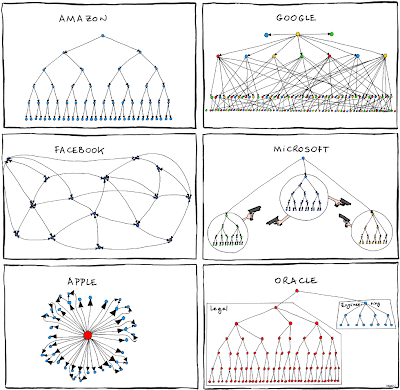 "Does the org chart you live with every day leverage your best people? " It is a challenge to think beyond the comic by Manu Cornet but it does go a long way to depict why these six companies are not just staying ahead of their competition, but simply changing the rules of the game-(so very often)-or at least as it was known before their emergence! Looking around, globalisation, Internet, and the collaborative tools has significantly changed a lot of things we took for granted-and while most of us are adopting some of the best practices, it is sometimes worrying that there is a 'lag ' in most of us to adapt to the dynamic world around us! In the contrast of the yester years, where managers controlled 'information' or the flow of it, the power has since been negated today. Knowledge is no longer a premium. It is the age of insight! If location was paramount in the past, e-commerce has made it a level playing ground. Sometimes I really wonder if only lip service is being given to 'human capitall'! Daily we see several large brands vanishing, as they are swallowed by even larger ones- as companies get closer to the customer. Most large MNCs and nimble start ups are keeping up with the change- having strategic alliances, off shoring, outsourcing, partnering -to stay ahead of the growth curve. As a talent scout, one can see several jobs vanishing- at least the impact of their earlier avatar is! Skills that used to demanded a few years back-are passe' now. New roles demand more ambidexterity! But the job descriptions remain the same!! We in India are very conscious of titles and designations. As we strive to match the competencies & aspirations of people with that of the clients -there is an increasing need to set expectations..to help both sides- the prospect employee and the employer that there could be a WIN WIN. Career planning-whose prerogative is it? The employer or the employee? Any thoughts? Would love your feedback as usual.